The Unofficial Mad Men Cookbook serves up more than 70 recipes to satisfy a Mad Men appetite From the tables of Manhattan's most legendary restaurants and bars to the Drapers' Around the World dinner, this book is your entree to the culinary world of Man Men-era New York. Packed with period detail, The Unofficial Mad Men Cookbook provides invaluable historical and cultural context for the food and drink featured in the show, tips on throwing a successful '60s cocktail party, and even a guide to favored Mad Men hangouts. Every recipe inside is authentic to the time. Whether you're planning a Mad Men-themed dinner party, need to mix up some authentic Mad Men cocktails, or just can't get enough of the show itself, this is your essential resource, a guide to all foods and drinks Mad Men. So hang up your coat, pour yourself a cocktail, and get ready to dine like Draper and drink like Sterling with The Unofficial Mad Men Cookbook. Judy Gelman is co-author of "The Book Club Cookbook: Recipes and Food for Thought from Your Book Club's Favorite Books and Authors" (Penguin, 2004), the first cookbook designed for book discussion groups. The second edition of "The Book Club Cookbook" will be published in 2012. She is also co-author "The Kids' Book Club Book: Reading Ideas, Activities, and Smart Tips for Organizing Terrific Kids' Book Clubs" (Penguin, 2007) and "Table of Contents: From Breakfast with Anita Diamant to Dessert with James Patterson - a Generous Helping of Recipes, Writings and Insights from Today's Bestselling Authors" (Adams, 2010). She is co-creator of bookclubcookbook.com and kidsbookclubbook.com. She speaks about cooking, food and reading to book and food enthusiasts across the country. Peter Zheutlin is the author of "Around the World on Two Wheels: Annie Londonderry's Extraordinary Ride" (Citadel Press, 2007) and the co-author, with Thomas B. Graboys, M.D., of "Life in the Balance: A Physician's Memoir of Life, Love and Loss with Parkinson's Disease and Dementia" (Union Square Press, 2008). He is also the co-author, with Robert P. Smith, of "Riches Among the Ruins: Adventures in the Dark Corners of the Global Economy" (Amacom, 2009). Mr. Zheutlin has also written for "The Boston Globe," "The Christian Science Monitor," "The Los Angeles Times," "The New England Quarterly" and numerous other publications in the U.S. and abroad. "Border[ing] on culinary anthropology . . . the cookbook offers an exhaustive history of New York dining in the 1960s, right down to the actual recipes used in Draper haunts like Sardi's and The Grand Central Oyster Bar." "Part cookbook, part annotated episode guide, this entertaining read has everything the die-hard Mad Men fan needs to host a fantastic cocktail party." "As fun as the book is, Gelman and Zheutlin offer solid, well-researched recipes that can be confidently served to guests." "A culinary love letter to the award-winning drama." "Mad Men isn't all about booze-swilling: There are also mealsplenty of meals. This stylish cookbook offers recipes for food that appears on the show, whether it's Betty's Turkey Tetrazzini or Sal's Spaghetti and Meatballs." "Surprisingly informative . . . It becomes clear that all the meals and snacks prepared, consumed, offered, and rejected on the series tell a story. . . Use the book as a primer for seasons 1 through 4 while you wait impatiently, bowl of homemade Chex Mix close at hand, for season 5 to air at long last." "[I]t is obvious that I would greet the [Unofficial] Mad Men Cookbook with extravagant enthusiasm. And I couldn’t resist [the] recipe for cream cheese and nut ballsthe perfect appetiser for your suitably retro cocktail hour." "Beautifully put together . . . it has a retro feel with a touch of timelessness . . . a must-have for any Mad Men fan." "A treat! It's like going back to our parents' time and childhood with a very different eye in terms of where we are in the culinary world today. A fascinating culinary time warp." "offbeat salute to the AMC series"
"Why give a ho-hum, everyday cookbook when you could give one that’s Don Draper-approved instead? This book serves up more than 70 recipes from the show . . . as well as oodles of historical detail . . . The Unofficial Mad Men Cookbook is sure to appeal to foodies, history buffs, and Mad Men fans alike!" "Season 5 of Mad Men won’t premiere until March, but that doesn’t mean you can’t get a jump-start on the festivities by throwing your very own soirée . . . But stiff drinks aside, how do you ensure your retro menu is period-appropriate? For that, turn to The Unofficial Mad Men Cookbook: Inside the Kitchens, Bars, and Restaurants of Mad Men." "While we desperately wait for the new season to arrive and console ourselves by watching AMC reruns and past episodes on Netflix, the book provides a new way of reliving the glory of the past, while building anticipation for the future." "The Unofficial Mad Men Cookbook is so pure: '60s classics like mushroom canapes on melba toast, turkey tetrazzini, chicken kiev. We love it!" "Mad Men's seemingly authentic representation of 1960s America stems from its attention to historical detailin terms of wardrobe, set dressing and cultural referenceswithout ever crossing into kitsch. The food on the show is no exception . 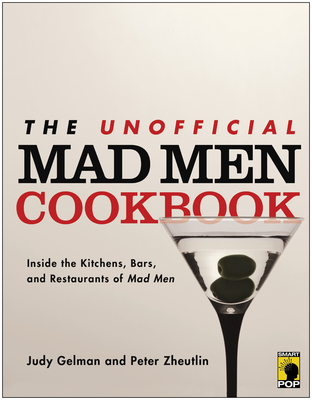 . . Happily, every canape, chile relleno and deviled egg has been collected into the The Unofficial Mad Men Cookbooka collection of recipes and historical context for nearly every bite or sip consumed on the show." "A more classic selection of original New York recipes has perhaps never been assembled . . . an entertaining collection, well-researched and ready for your weekend soirees and viewing parties." "The Unofficial Mad Men Cookbook is a flashback to the days of My Three Sons, Leave it to Beaver, and the Donna Reed Show all wrapped up in a neat bundle with a fun romp through the food of that era. If you wish you had grown up in the 1960s, relish the idea of having a cocktail hour every night or wish it was still appropriate to wear a silk chiffon dress and pearls to go to the grocery store, you will love this book." "If you can’t wait for Mad Men and Jon Hamm’s face to get back on the air . . . whet your appetite with The Unofficial Mad Men Cookbook . . . It takes home cooks back to the culinary world of 1960s America." "For the budding chef or burgeoning mixologist the recipes in The Unofficial Mad Men Cookbook are a chance to really test your throwback brawn in the kitchen with style, flair, and a touch of mid-century glamor. While for the seasoned foodie it is a walk through the history of the American table. And it is the definitive guide to all the best cocktails and snacks for your Mad Men premiere partythe party for which I am anxiously awaiting my email invitation." "[The Unofficial Mad Men Cookbook] is like a nifty culinary time capsule . . . it's the next best thing to being there." "Authors Judy Gelman and Peter Zheutlin have paid as much attention to period detail as the show's creators by tracking down versions of recipes that would have been served during the Mad Men era." "In a volume that’s equal parts cookbook and historical snapshot of 1960s New York, Mad Men fanatics Judy Gelman and Peter Zheutlin help readers savor nearly every sip and morsel swallowed by Don Draper and crew during the show’s first four seasons." "The . . . authors and their team got it right. Thanks to loads of research, testing and attention to detail, The Unofficial Mad Men Cookbook . . . will pull you straight into the scenes of the AMC Emmy Award-winning show’s dining and drinking delights!" "Get the matches, light the stove, chill your glasses. Your menu's right here." "The . . . authors have immersed themselves in Matthew Weiner's 1960s, keenly examining the series in search of the recipes shared in their book. And the recipes are spot on, from cocktails to canapés, every one introduced with a synopsis of the episode it was plucked from." "Like a meal in a fine restaurant, The Unofficial Mad Men Cookbook is elegant in its presentation...extra attention to detail is what elevates this book over other cookbooks . . . Even if you never cook a thing, it’s still a good read." "[A]s much a history lesson as a recipe collection." "[C]hock-full of recipes and back stories of the show's drinks, deserts and entrees."